The incidence of early post-traumatic seizures (within 7days of injury) is reduced by prophylactic use of phenytoin However, prophylactic use of phenytoin has no beneficial effect on the late post-traumatic seizures or mortality following severe head injury. In persistent vegetative state there is preservation of complete or partial brainstem functions: the patient is able to spontaneously breathe and maintain blood pressure. The patient also has a partial or complete preservation of hypothalamic functions. The persistent vegetative state is characterized by a combination of periods of wakefulness (preservation of sleep-wakefulness cycle) without evidence of a working mind. (patients can be in persistent vegetative state without having periods of wakefulness: e.g. if there is bilateral CN III palsy as well from the original injury). Jennett B. The vegetative state medical facts, ethical and legal dilemmas. Cambridge: Cambridge University Press; 2002. There is no nystagmus on 'caloric reflex' testing in an unconscious patient. However if the brainstem function is intact then the eyes will deviate to the side of the ear which was irrigated with the cold water (30°C). On irrigation with warm water (44°C) water the eyes will deviate towards the contralateral side. There will be no response to caloric reflex testing when there is brainstem death. 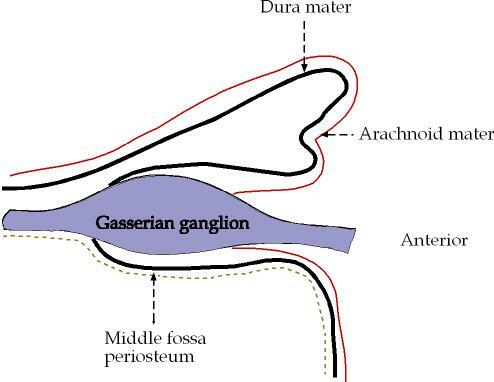 Gasserian rhyzolysis involves entering the gasserian ganglion anteriorly. It is the posterior part of the ganglion that lies within the subarachnoid space in the Meckel's cave. Sinnatamby CS. Last's Anatomy Regional an Applied. 7 ed. Edinburgh: Churchill Livingstone; 1999. Multi-centre study involving many neurosurgeons and neuroradiologists. The expertise of the practitioners are not likely to be identical; the study did not compare the best neurosurgery practice against the best endovascular practice. In ISAT only patients who were considered suitable for either endovascular or neurosurgical treatment were included in the study. Therefore which patients to include in the study would have varied from centre-to-centre depending on the practice and experience of neurosurgeons and neuroradiologists at different centres. The follow-up period was short: 1 year. One of the principal investigators had consulting and advisor agreements (and stock options) with 2 companies manufacturing equipments for neurovascular procedures. 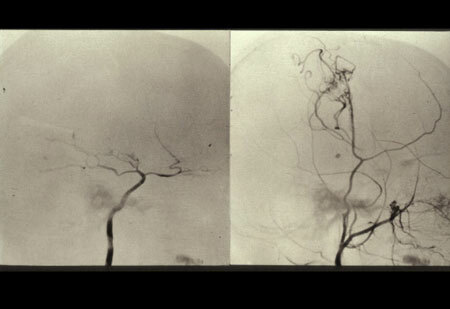 Molyneux A, Kerr R, Stratton I, Sandercock P, Clarke M, Shrimpton J, Holman R; International Subarachnoid Aneurysm Trial (ISAT) Collaborative Group. International Subarachnoid Aneurysm Trial (ISAT) of neurosurgical clipping versus endovascular coiling in 2143 patients with ruptured intracranial aneurysms: a randomised trial. Lancet. 2002 Oct 26;360(9342):1267-74. 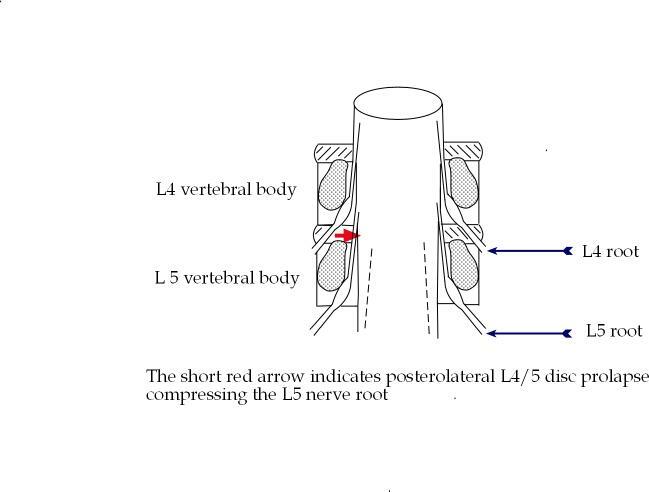 Posterolateral L4/5 disc prolapse commonly presents with symptoms and signs corresponding to L5 radiculopathy. Wilkins R. Lumbar intervertebral disc herniation. In: Rengachary SS WR, editor. Principles of Neurosurgery. London: Mosby-Wilfe; 1994. p. 45-45.9. In Gerstmann's syndrome there is bilateral asomatognosia (asomatognosia = inability recognise part of one' body). The characteristic features of Gerstmann's syndrome are: finger agnosia, confusion of right and left sides of the body, acalculia and agraphia. Gerstmann syndrome is associated with lesion in the dominant parietal lobe. Victor M RA. Adams & Victor's Principles of Neurology. 7 ed. New York: McGraw-Hill; 2001. Mineralocorticoid activity leads to retention of Sodium and water in the kidney. Dexamethasone has almost no mineralocorticoid activity and therefore preferred where water retension is to be avoided e.g vasogenic oedema surrounding cerebral metastasis. Prednisolone and aldosterone (i.v) have 0.8 and 1000 times the mineralocorticoid activity as hydrocortisone respectively. Titter JM LL, Mant TGK. A textbook of clinical pharmacology. Fourth ed. London: Arnold; 1999. 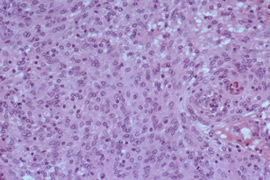 It is of meningothelial meningioma with sheets of endothelial cells with little evidence of whorl formation.